With the cult classic 2004 film as source material, Mean Girls follows in the fertile footsteps of Hairspray, Heathers and Legally Blonde. 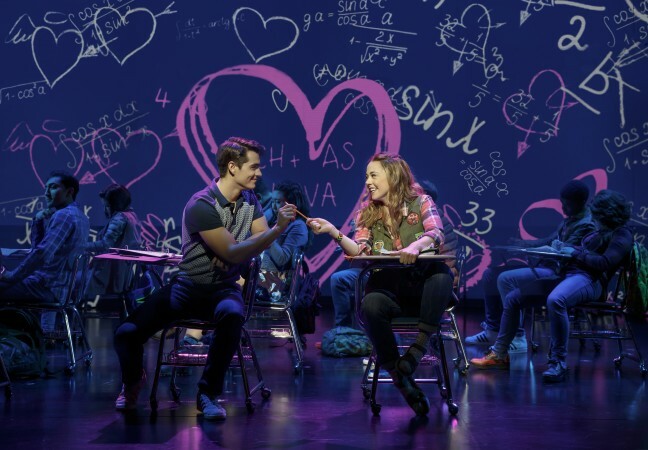 The new musical packages an appealing young cast, vivid design, catchy music and an abundance of laughs, sneaking in the odd inspirational message for good balance. Adapting her movie script for the stage, Tina Fey proves that there is no medium she cannot master. Fey sprinkles the book with her trademark take on the cultural zeitgeist, yet sets aside her usual self-referential tone to adopt an authentic teenaged voice. Even better, Fey completely avoids the common trap for young players who place too much importance on their text; Fey has clearly allowed songs to cannibalise her scenes, jettisoning spoken text to allow brisk transitions between songs, and the show is all the stronger for it. Having previously been home-schooled in Kenya, new girl Cady Heron faces survival against a new set of predators at well-heeled North Shore High. Initially adopted by fringe dwellers Damian and Janis, Cady soon infiltrates popular clique the Plastics only to find the power so seductive that her own behaviour spirals out of control. 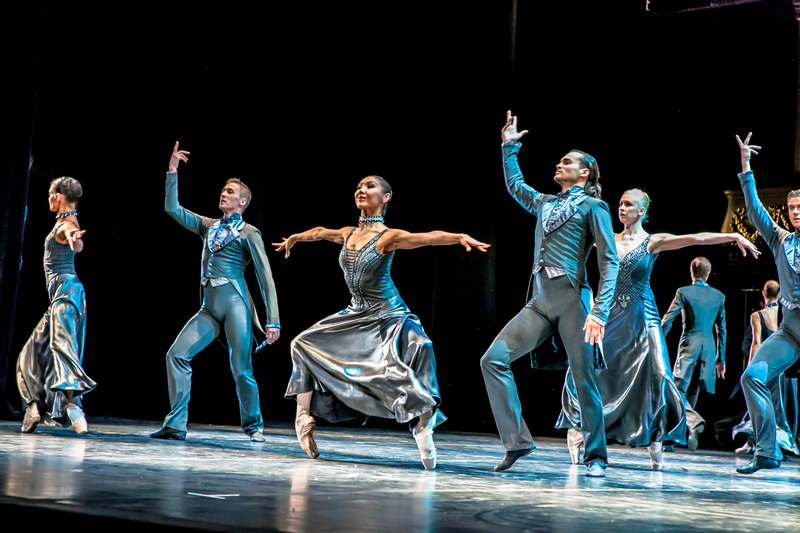 Exposition unfolds at such a breakneck pace in act one that a faint fear takes root as to whether the second act can tie all the threads together. Allaying any such concerns, act two has its own twists and turns, ultimately delivering an immensely satisfying conclusion. Characters are keenly observed and sharply drawn, and behaviour stays ever true to form. Actual teen issues are given just enough air time to be impactful but not preachy. Well-loved phrases from the film are met with grateful glee from the crowd, and the text is updated to include a couple of jibes at the country’s current administration (without mentioning any names). The Kenyan theme provides a point of difference to other teen comedies, with plenty of mileage deriving from Cady’s viewing of teen packs alongs the same principles she used in Africa. Jeff Richmond (husband, and frequent collaborator, of Fey) has fashioned a score which is catchy if not quite as instantaneously infectious as gold standards Hairspray and The Book of Mormon. Lyricist Nell Benjamin (Legally Blonde) successfully matches Fey’s tone, allowing a seamless transition between sung and spoken word. Continuing his blistering peak form, director/choreographer Casey Nicholaw once again delivers the goods. Mean Girls is almost entirely set at school, and, as such, there is barely a song that does not feature the ensemble. Nicholaw has crafted a choreographic vocabulary that draws on the teen tendency to have energy that must be released. Specific highlights include a percussive number using red plastic cafeteria trays, and a terrific tap number at the top of act two. Every aspect of the show is tightly choreographed; not just the performers, but also the movement of set pieces and even the transitions between images in the colourful animated video design (by Finn Ross and Adam Young). 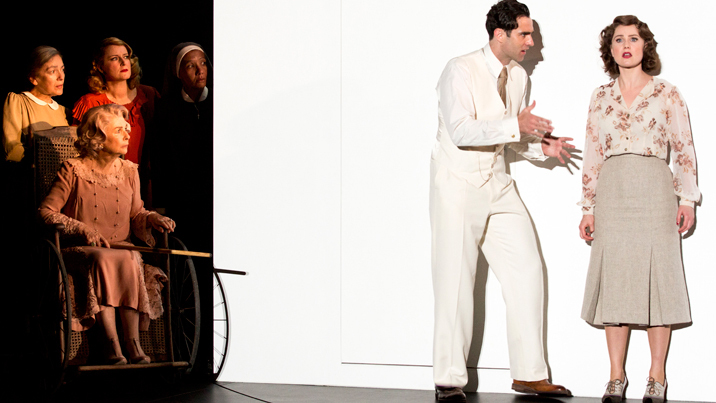 The foundation of Scott Pask’s scenic design is rear curved LCD screens, allowing rapid-fire flow between locations. Gregg Barnes’ costume design pinpoints teen stereotypes with flair, still giving every ensemble member a distinctive look. Barnes adds to the humour with lashings of visual wit, especially the Halloween costume party. Act two opens with “Stop,” in which the girls make each other promise to think carefully before acting. Cady proves the biggest failure at this, and consequences follow swiftly. 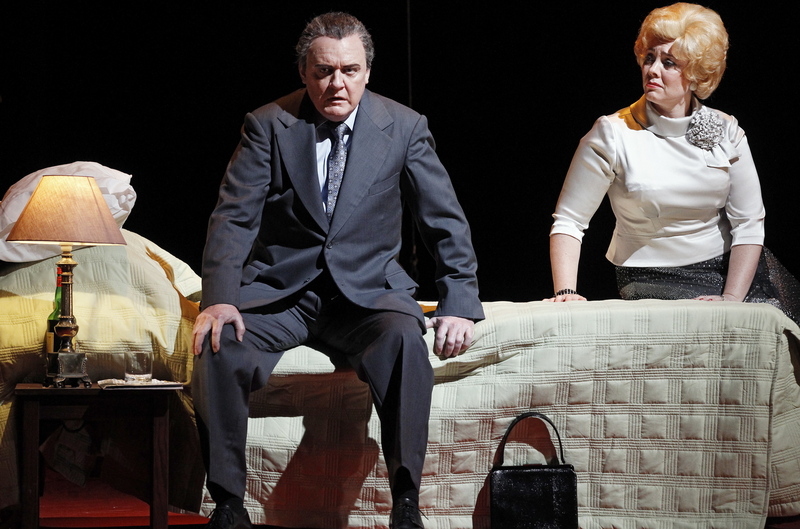 Erika Henningsen underpins Cady’s devilish ascent with sincerity, managing to keep audience affection even when the young woman is at her worst. 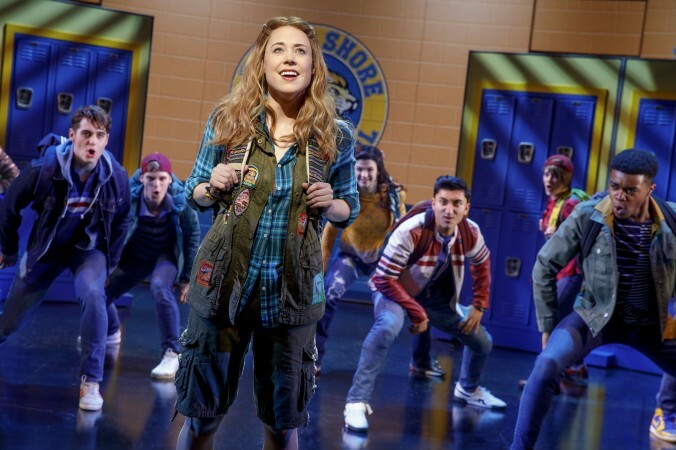 Likewise, Taylor Louderman finds a trace of humanity in queen bee Regina George, in part gaining sympathy when a prank causes her weight to balloon. As Regina’s right hand beyotch Gretchen Wieners, Ashley Park captures the relentless will to please of a young woman suffering from low self esteem. Even at her gossiping worst, Park holds our sympathy for Gretchen. Kate Rockwell is delectably vapid as air headed beauty, Karen Smith. Rockwell’s comic delivery is superb, and she scores the biggest reaction of the night when Karen speaks out against sexting. Every drama department has at least one chubby gay guy, and Damian Hubbard is the best new role for such boys (when the show eventually enters the high school circuit) since Edna in Hairspray. Grey Henson plays Damian with unaffected charm, singing and dancing with effortless flair and loads of character. Kerry Butler has the distinction of playing both the Tina Fey and the Amy Poehler roles from the movie, switching swiftly from pushy Maths teacher Ms Norbury to flighty cool mom Mrs George. 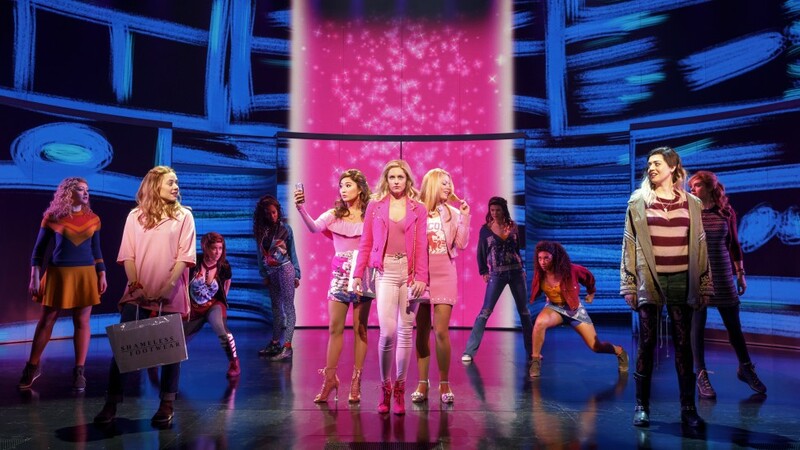 Mean Girls has commenced its Broadway run as a hot ticket, a situation likely to escalate as positive word of mouth spreads. The new musical is sure to play London, Australia and beyond, with a prolific non-professional life to follow. 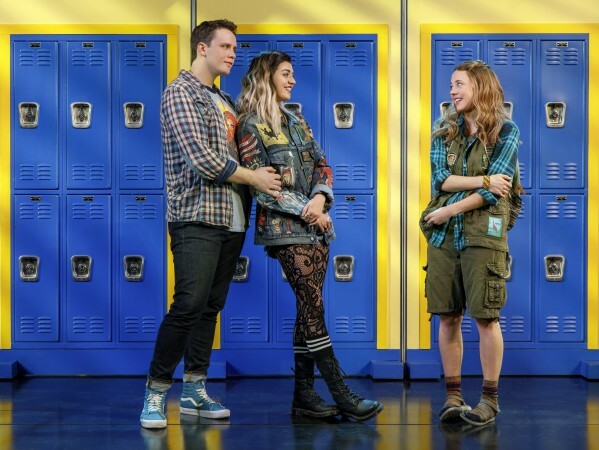 Mean Girls plays at August Wilson Theatre, New York. 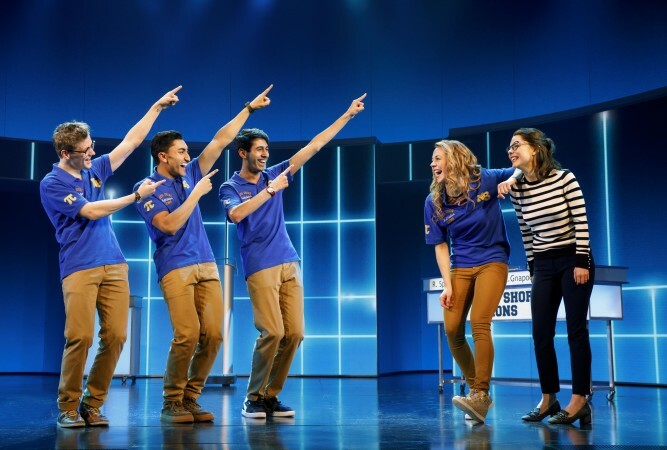 Footnote: having solved the final Mathletes question before the characters, Man in Chair had not felt such a giant nerd since the time he was the only audience member to laugh at a particular maths joke in the play Proof.